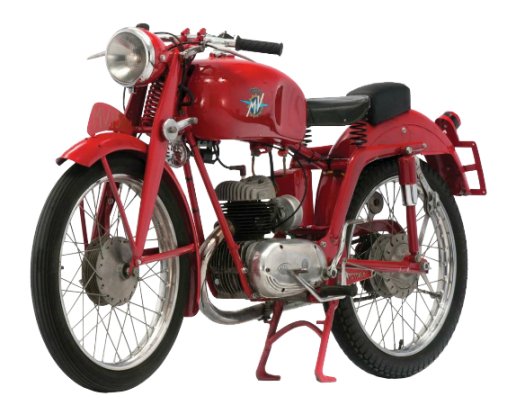 MV AGUSTA 150CC SPORT "E"
Until 1951, Italian motorcycles up to 125cc did not have to be registered, making them very popular. When the exemption disapeared in 1951, the market for stronger engines grew. As MV gained more experience in trails competition, the buitl bikes that could hold their own on all types of terrain. With its extra ground clearence, a reinforced suspension, ans light alloy central drum brakes, this bike could reach 100 Kph, thanks to its beefy 9HP single-cilinder, 2 stroke air-cooled engine. The engine case was used as a structual element in the frame, keeping the weight to a minimum. The front suspension used a pressed steel parallelogram fork, while the rear suspension utulized a swingarm with mechanical shocks. Prices in 1952 ranged from 200.000 to 240.000 Lire.